When it comes to wood construction, many people think of basic 2×4 framing, panels or flooring for single-family homes. However, advances in wood science and building technology have resulted in stronger, more sophisticated and robust products that are expanding the options for wood construction, and providing more choices for builders and architects. 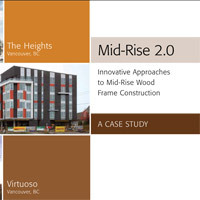 The Canadian Wood Council’s support for mid-rise construction is not unique In Ontario, Home Builders, through organizations such as RESCON, BILD and the Ontario Home Builders Association are also highlighting this opportunity. Mid-rise buildings made of wood are a new construction option for builders. That’s good news for main-street Canada, where land is so expensive. The net benefit of reduced construction costs is increased affordability for home buyers. In terms of new economic opportunity, the ability to move forward “now” creates new construction jobs in cities and supports employment in forestry communities. This also offers increased export opportunities for current and innovative wood products, where adoption in Canada provides the example for other countries. This also reflects a new standard of engineering in that structural, fire and seismic concerns have all been addressed by the expert committees of the Canadian Commission on Building and Fire Codes. In the end, when occupied, mid-rise buildings fully meet the same requirements of the Building Code as any other type of construction from the perspective of health, safety and accessibility.